Human beings have evolved to be very visually driven creatures. Think about having a phone call with a stranger versus a Skype chat? It’s uncomfortable, right? Because you’re missing out on vital visual cues, those subtle tics and other types of body language we use to communicate every single day. I would venture to guess that our ability to visually decipher information—our brains processes visual cues 60,000 times faster than text—is a huge part of what’s kept us alive and thriving over the past few hundred thousand years. Which takes us to content marketing (nice segue, right?) In content marketing, the use of images and other visual content plays a huge role. Over the past few years, we’ve seen the top three social media big boys become more and more image driven. Facebook, LinkedIn, even “140 characters only” Twitter have all made changes that include a bigger emphasis on visual content. According to Hubspot, when Socialbakers.com took a look at the top 10 percent of posts made by more than 30,000 Facebook brand pages, they came back with some impressive results. Posts with photos saw the most engagement—accounting for a whopping 87 percent of total interactions. Twitter fared well also, with tweets with images garnering 18 percent more clicks, 89 percent more favorites, and 150 percent more retweets. And other super successful visual content platforms have grown up around the big boys, like Pinterest, Instagram, Snapchat and Slideshare. 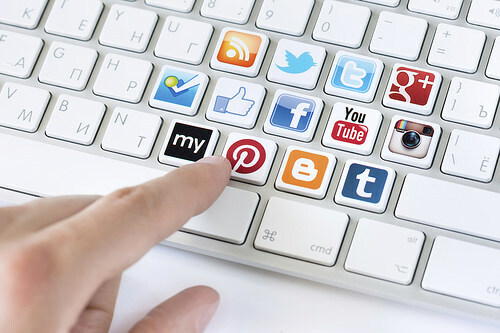 Today, it would be difficult to argue the fact that social media audiences engage more with rich media content. Now, don’t despair yet for the written word. We still like to read (as long as it’s quality!) and for most brands and marketers one key strategy employed to attract new customers is telling their brand stories through content marketing. But with so much content being posted and time being limited, this can be a challenge. Researching and experimenting with different tools is what we do best here at V3Broadsuite. One tool we have found really interesting is SlideBatch. The feature I like most about this tool is that you can easily curate ideas and thoughts around topics that are interesting to you, your clients, and your audiences. With SlideBatch, you’re able to collect all the information you need in one place. You can easily drag and drop media files from a variety of sources (including images, SlideShare, news and other blogs, video files from YouTube, Vimeo, etc.,) as well as your own original content like infographics and photographs you have taken. You can then select from a wide range of templates and designs and presto – you’ve created your batch. You can view any of the content created with SlideBatch on any device – they’re not slouches and are fully mobile friendly. Since launching their beta product about a year ago, SlideBatch recently started a crowdfunding campaign on crowdfunder.com in order to take their offerings to the next level. Great news for content marketers everywhere. If you want to try it out, check out their free version—the paid plan starts at $45 a month—or watch this short video on what SlideBatch is all about. Or both! Here’s an example of what we have created that showcases some of the content we created during the #IBMAmplify summit we attended recently. If you do decide to create your own content using this tool, please let me know what you think. I would love to see what you have created. Lindsay Bell is the Director of Content Services at V3*Broadsuite. She leads our team with regard to content marketing, including strategy, ideation, execution, and editorial expertise. She’s our token Canadian and lives in Toronto with her cool kid, patient husband, two annoying cats, and Hank Dawg—a Vizsla/Foxhound/moose hybrid. Ok, maybe not a real moose.